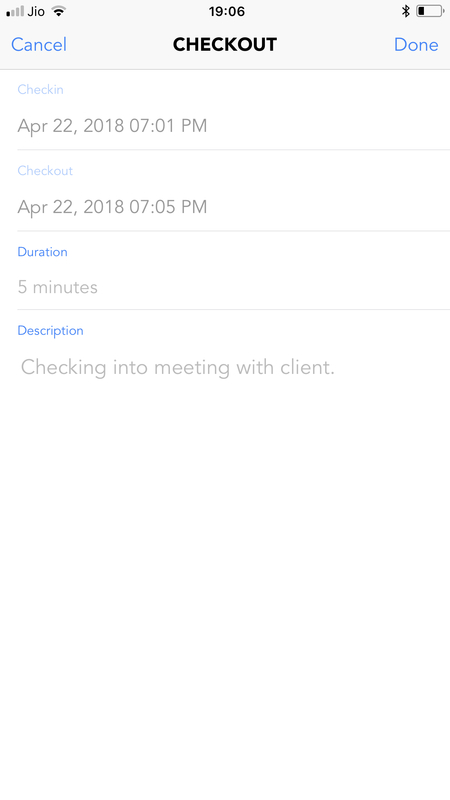 With the ClockIt mobile app users can also checkin into locations. Here is a typical use case for this. User starts his/her day by clocking in. They may visit several locations during their shift and can record this with checkins and checkouts. Each checkin can be paired with photos and comments. 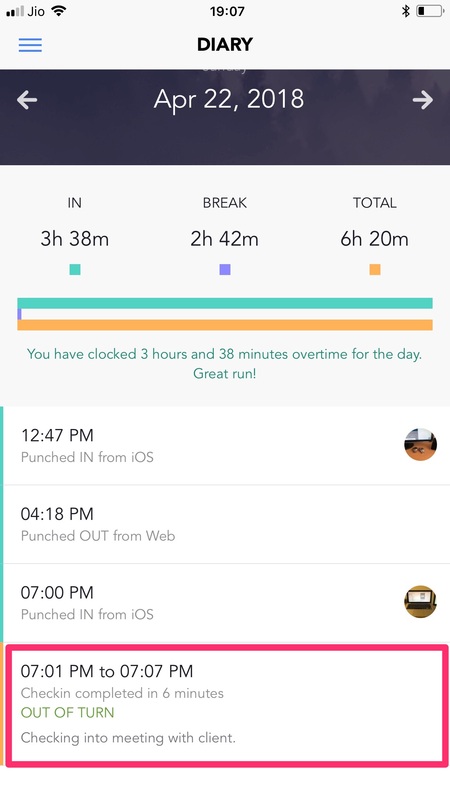 Users end their shift with by clocking out. 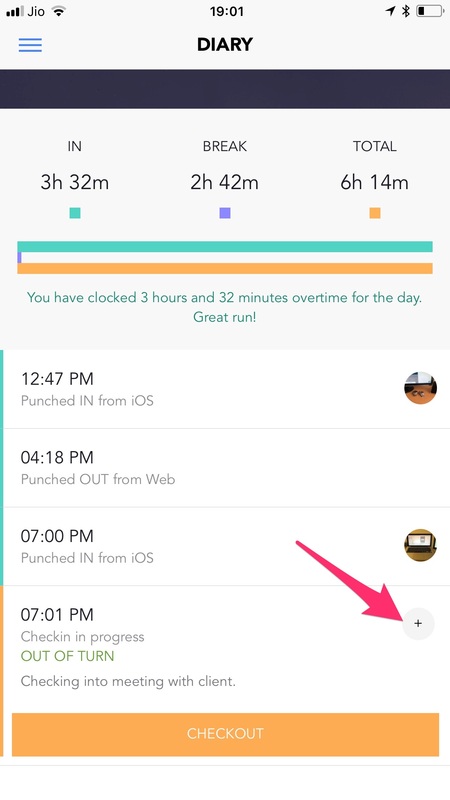 Now you will know the exact work duration with the punch in and punch out. 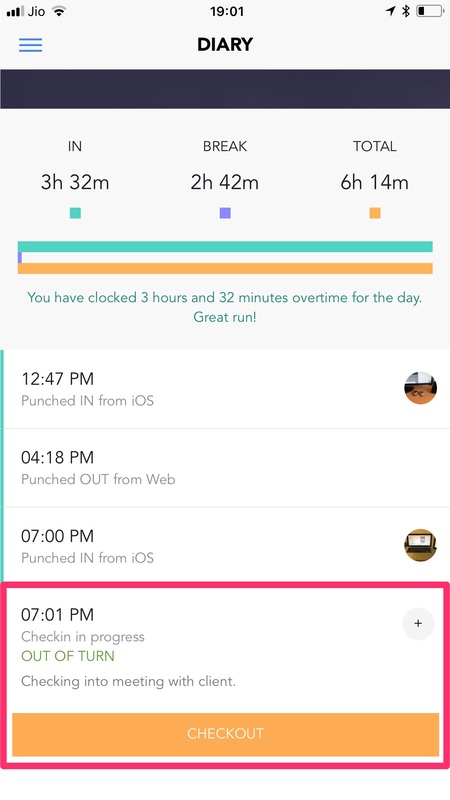 Additionally you will also know the total time that was spent at each location with the checkins. 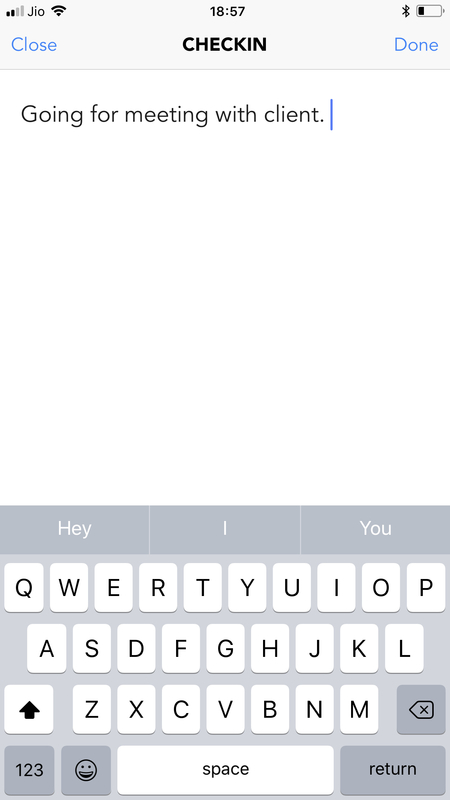 To checkin with the mobile app. Click on the hamburger button and then click on checkin. 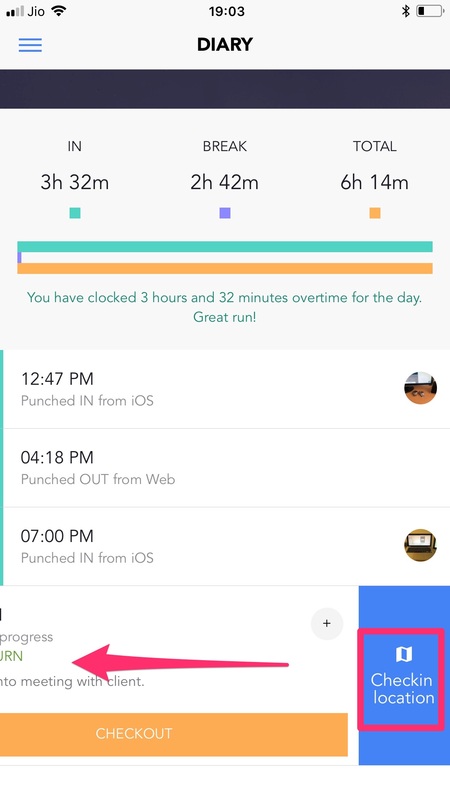 ClockIt will automatically capture your geolocation and save it along with the checkin. If your administrator requires you to give a note at the time of checkins, you will need to enter them in the next screen and click save. 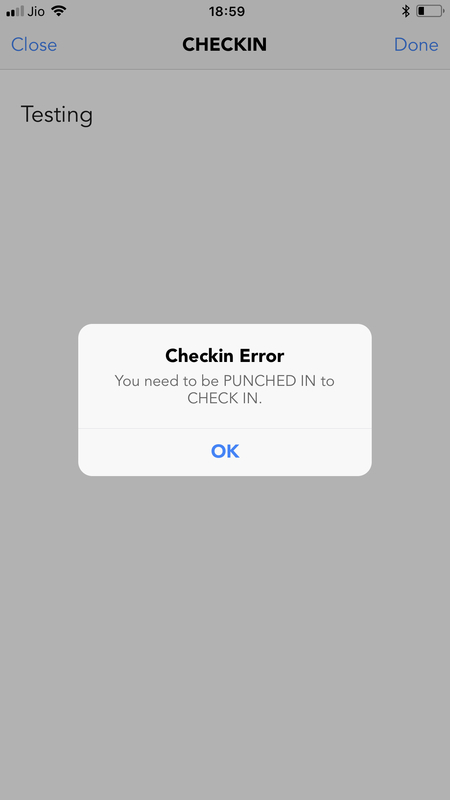 Depending on your company policy, you might need to be punched in in order to checkin. If not your checkin can fail. Know more about the punch settings. After your checkin is saved you will be able to see checkin card in your diary. To add photos click on the camera icon in the checkin card. You can add upto 3 photos for each checkin. To view your checkin location swipe on the checkin and ClockIt will open this location on Google Maps or Apple Maps. Verify the details of your check our and then click on checkout. If your company permits you to edit the checkout time, click on the edit button and then update your check out time. After you checkout your checkout card will be updated. 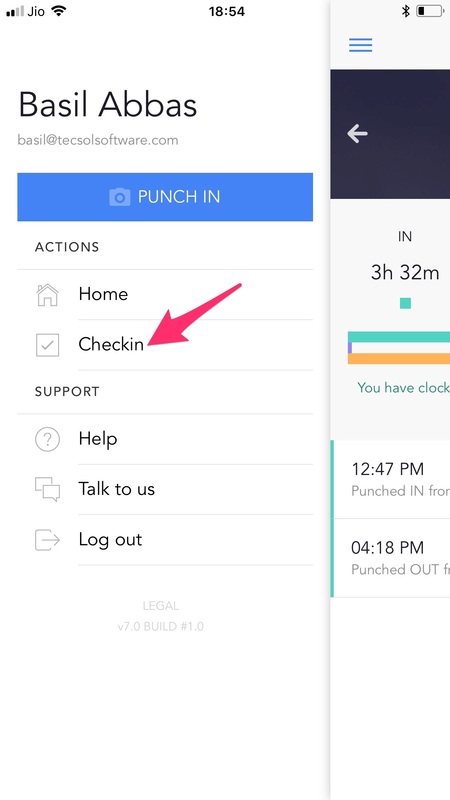 Your company punch settings can block from all future checkins if the previous checkin has not been checked out from. It may also be mandatory to upload photos at the the time of checkouts. Depending on your company settings you may only be able to checkout from your checked in location and within a fixed radius. Your company settings also defines geofences for checkins. So this means if you may be able to checkin only from fixed locations. If a checkin is completed against a route then the card will read ROUTE if not the card will read OUT OF TURN. All checkins can be see in the user profile under mobile checkins.